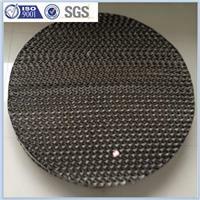 Metal Structured Packing(Metal Perforated Plate Corrugated Packing) is made of perforated plate with channel corrugation on surface,and remains structured feature of metal wire gauze packing.It strengthens uniform liquid distribution and surface wetting ability,which incerases mass transfer efficiency. Metal perforated plate corrugated packing is available in a wide range of materials, include stainless steels, 304, 316, 316L, Carbonsteels. Aluminium, copper bronze etc. Further materials available on request. 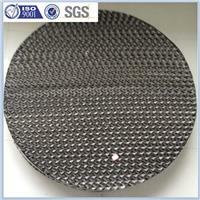 Perforated plate corrugated packing with the wide range of applications. System: Ethylbenzene/ styrene, Fatty acide, cyclohex anone/ cyclohexanol, caprolaction, etc, Absorption desorption.